The new Launchpad is brighter, faster and more powerful than the original, but costs the same. What's not to like? I'm starting to lose track of the number of grid-based DAW controllers I've reviewed over the last few years. From the original Monome to devices from Livid Instruments, Akai, Keith McMillen and, of course Ableton's new controller, the Push (reviewed in the March 2013 issue of SOS). Novation were pretty quick off the starting block with the original Launchpad (reviewed in the December 2009 SOS), but a lot has happened in the intervening years, and the company clearly thought it was time for an update, in the form of the Launchpad S.
The Launchpad S is the same price as the older model, but also, Novation say, faster and equipped with brighter LEDs, which addresses two of the major drawbacks of what from here on in I'll call the 'Launchpad 1'. The Launchpad S doesn't feature RGB LEDs or any other obvious functional additions over the original, but it's small, cheap and, in the short term, possibly more easily obtainable than the Push. Opening the box, you find the Launchpad S itself, a Getting Started guide, a registration card, some software template stickers and the characteristic right-angled USB cable. There's no bundled CD or DVD (which, to be fair, would be wasted on many users without DVD drives); instead, all the 'bundled' software and documentation has to be downloaded. The online registration process is fiddly and irritating — more so than it needs to be, I feel, to protect the bundled applications from casual piracy — but once done, you get Ableton Live Launchpad Edition (which seems to be a rebadged Ableton Live 8 Lite), Loopmasters Content loops, additional manuals and Windows drivers. The Launchpad S is compatible with Novation's Automap controller mapping system, although I didn't test this. 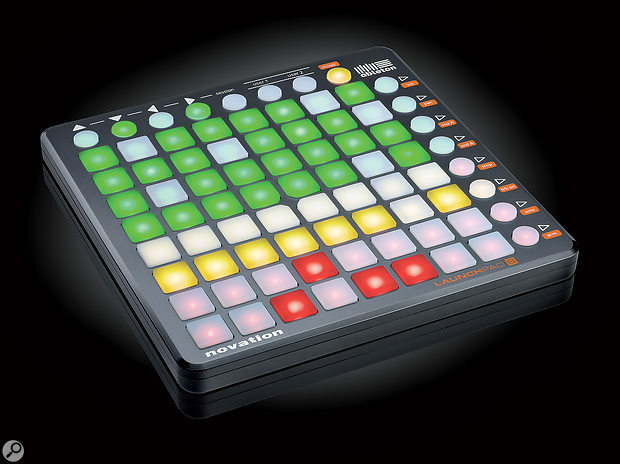 Unlike its predecessor, the Launchpad S is a class-compliant MIDI device. It doesn't need any drivers and, sure enough, it appeared in the MIDI setup screen on my Mac Pro, which doesn't have the Launchpad 1 drivers installed. This is a major plus: I have a distrust of third-party drivers, and don't need the hassle of checking and upgrading drivers right up until support for my machine or OS is dropped. Class compliance also gives Linux-based musicians a chance to play, and makes the new Launchpad compatible with the iPad (via Apple's Camera Connection Kit — see the 'iLaunchpad' box). The Windows drivers I mentioned above are a workaround for a Windows-specific problem: the standard drivers only allow a device to be accessed by one software program at a time. If you want to share the Launchpad S between applications, or use Automap, you'll need Novation's drivers. The Launchpad S is exactly the same size (and, as far as I can ascertain, the same weight) as the Launchpad 1. The most obvious change is to the case: the original black has been replaced by a slightly metallic-looking dark grey (I think Airfix modellers used to call it 'gun metal'). All the controls are the same shape, size and in the same position, and side-by-side testing of the two Launchpad models suggests no change to the material or mechanism behind the buttons. There are, however, some changes to the labelling: the Launchpad S does not feature printing on the buttons themselves, with text and icons moved onto the case or, in some cases, removed altogether. I plugged the Launchpad S — as well as my Launchpad 1 — into my Mac via a powered USB hub, and fired up Ableton Live 9. After a few seconds of configuration, Live assumed it had two original Launchpads attached, and everything worked fine. The Launchpads operated identically. Although it's not immediately apparent, a lot has changed under the hood in the Launchpad S: there's a new, faster processor, improved LED circuitry, and an updatable firmware layer that allows some device configuration. One of the configuration options is a device ID, allowing the USB name of the Launchpad to be changed; so if you want to use two or more units together, your software will now be able to tell which is which. In actual use, the only perceived difference between the Launchpad S and the Launchpad 1 — apart from LED colour and intensity — is refresh speed. The original model was pretty lethargic when it came to refreshing large numbers of LEDs at once; switching between mixer pages resulted in a pretty obvious scrolling effect as the pad matrix was repainted. By comparison, the Launchpad S is lightning fast and the entire matrix updates in the blink of an eye. Most other matrix controllers on the market are essentially instantaneous; at last, the Launchpad is able to keep up. I liked the original Launchpad, but its limitations (dim LEDs, slow performance) were fairly apparent even when it was a new product, and in terms of functionality it's been rather eclipsed by more recent, full-colour grid controllers. I was expecting to be disappointed by the Launchpad S, which offers little new in terms of features, but I found myself liking it a lot. It's super-fast and super-bright, while remaining as simple, portable and affordable as the original. There's a lot to be said for conservative enhancement, and I think this particular controller sequel deserves to do rather well. The Launchpad S claims iPad compatibility, so I plugged it into my iPad 3 via the Camera Connection adaptor to see how it fared. The Launchpad needs to be in low-power mode for the iPad to power it, but if you want the LEDs at full intensity you can go full-power by using a powered hub between the iPad and Launchpad. I fired up Novation's Launchpad iPad app and the Launchpad S obligingly mirrored the app, allowing loops to be triggered and effects to be punched in from the pads, with the LEDs following the display state of the app. I verified that the Launchpad S works as a generic MIDI controller using a free app called MIDI Monitor. Sure enough, the pads generate notes, while notes sent back illuminate the LEDs. Obviously, apps need to be made 'Launchpad-aware' to drive the device in all its multi-colour, multi-level glory. Novation have made the MIDI specification available online, so if you're feeling adventurous you could probably roll some of your own support code in something like Liine's Lemur app. A successful 'reboot' of an established and popular product. Clear, bright, high-intensity LED display. USB class-compliant and iPad compatible. No significant feature additions over the original Launchpad. The setup for full-power mode is only mentioned in the online Advanced Features Guide. Half-intensity red and amber illumination hard to distinguish in low-power mode. The online registration process is fiddly and irritating. The Launchpad S is simple, portable and affordable and offers better performance, a brighter display and easier interfacing than the original Launchpad.